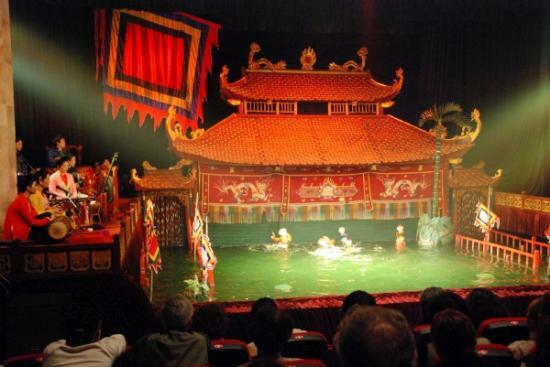 The water puppet stage. The performers on the left played the music and told the story which was a local legend about King Le Loi and a sword wielding turtle from the lake in from of the theater. The puppeteers were behind the curtain and controlled an interesting array of puppets with long polls. Dragon puppets shot sparks from their mouths as they swam about. A fisherman puppet is thrown off his boat and swims front and backstroke. Two swan puppets mate and their resulting egg hatches into a baby swan. It was quite ingenious and entertaining.